Epoxy flooring is best loved by many people because of its numerous benefits. This flooring option is durable, secure and extremely beautiful. It can also be customized to your desired color. 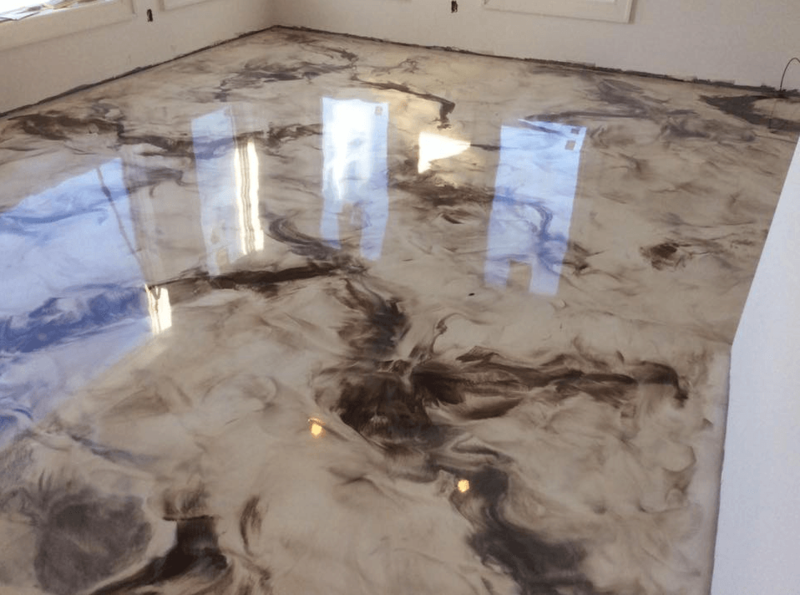 If you are considering an epoxy flooring installation in Palm Harbor trust the experts in Florida Epoxy Pros to make you reap the benefits of this amazing flooring solution. Concrete floors are durable but in due time they will tend to deteriorate showing signs of chipping, cracking and staining. 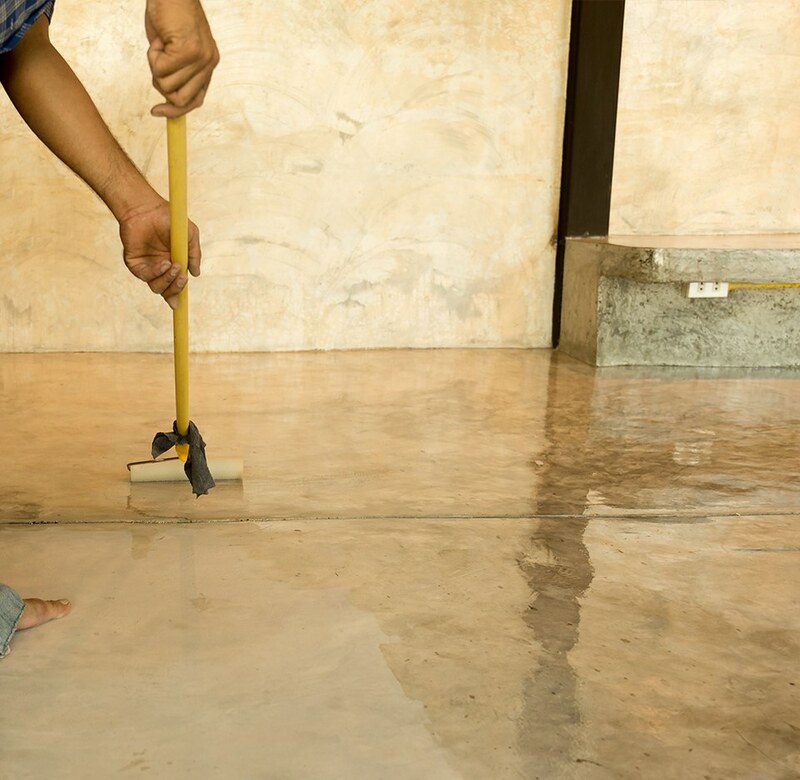 To prevent any more deterioration, concrete floors need to be sealed for protection. Epoxy flooring is an option to protect the concrete floor to make it more durable, beautiful and functional. An epoxy flooring material is a result of a chemical reaction between equal parts of resins and hardeners to create a thin plastic-like material. Different types of resins can be combined to create unique and different looks. Before epoxy flooring installation, there are certain factors that need to be considered. For the epoxy material to bond well with the concrete surface, it needs to be properly prepared. The surface should be smooth and not have any chips or cracks. Grinding the concrete surface to make it smooth is an important step prior to epoxy installation. The concrete surface should also be free of moisture, dust, dirt and any contaminants that may get into contact with the epoxy material. When the concrete surface is not properly prepared the installed epoxy flooring may show signs of bubbling, peeling, hard lumps and surface degradation. Proper preparation of the concrete surface is needed for both old and new concrete. Diamond grinding and shot-blasting are the methods used to prepare the concrete surface prior to epoxy flooring installation. Although it will take more time, Florida Epoxy Floors makes sure the concrete surface is properly prepared prior to epoxy flooring installation. Epoxy flooring is resistant to moisture but moisture should not be present in the concrete surface during installation. The presence of moisture will prevent the proper bonding between the epoxy material and the concrete surface. Epoxy flooring is available in a variety of colors or you can combine colors to come up with a unique color. It is also available in various designs or you can also create a customized design for a one of a kind look. The level of sheen of epoxy flooring is not just for aesthetic value. A high gloss finish enhances the level of reflectivity of the floor. This reduces the dependence of the area on artificial lighting. Color chips or flakes are often sprinkled over newly installed epoxy flooring or mixed with the epoxy material to create a decorative look. Color chips or flakes also add texture to the epoxy flooring to provide it with anti-slip features. Surface preparation can take some time. Actual epoxy flooring application is fast and quick depending on the area. The longer the epoxy flooring is allowed to cure, the tougher and more durable it becomes. 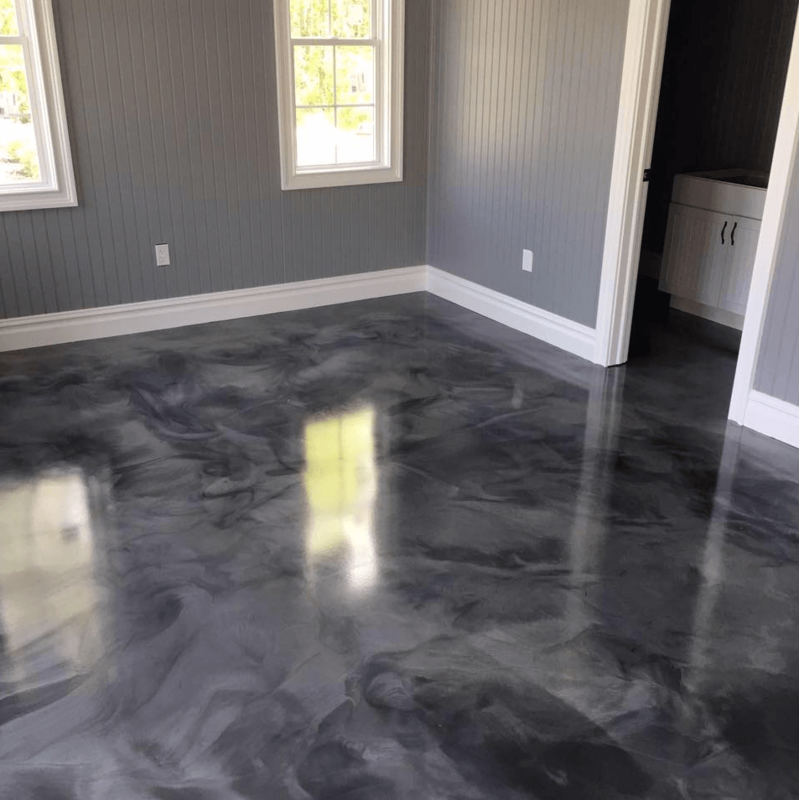 Polished concrete is the mechanical grinding and polishing of the concrete floor. It is a multi-step process to achieve the desired sheen. Progressively coarse tools are used to refine the concrete surface. Decorative concrete includes stamped concrete, overlays, stencils, exposed aggregates and other similar techniques. Decorative concrete entails the application of designs, patterns and colors to the concrete surface through stamps and stencils. Decorative concrete can create floors that can have the look similar to natural stones, marble, slate, brick, tile and other expensive flooring materials. Decorative concrete is a long lasting flooring option that can add value to your home. Stained concrete is classified as acid stains, penetrating stains and film-forming stains. Regardless of category, these stains are available in a wide range of colors, shades tints and textures. Different techniques are used to create each unique decorative look. Acid stains. These stains chemically react with the concrete surface to create a marble-like look by literally etching the concrete surface. Penetrating stains. These stains penetrate deep into the pores and bond with the concrete surface. These stains are usually water-based and are available in almost any color, shade and tint imaginable. Colors can also be combined to create a distinct and unique new color. Film-forming stains. These are the oldest types of stains but are still commonly used today. They are simply coated on top of the concrete surface just like paint. Overtime, fine-forming stains will fade or peel. Epoxy garage flooring is one of the best finishes you can apply on your garage floor. It is beautiful, extremely durable and resilient to chipping, cracking, impacts, abrasions and stains. Epoxy is a topical sealer thus epoxy garage flooring is also resistant to dust and moisture. Dust will not penetrate or stick to the epoxy flooring making it easy to clean and maintain. Dust and other debris can be collected by a broom or dust mop. You can opt to add acrylic colored flakes or chips to the epoxy flooring to make epoxy garage floor more appealing and slip-resistant. Proper concrete floor preparation is the key to proper epoxy flooring installation. The professional installers at Florida Epoxy Pros will always properly prepared the concrete surface prior to epoxy flooring installation. They will also use the right epoxy products based on your desired results. Epoxy flooring installation can be fast and quick. It however entails a complex process. 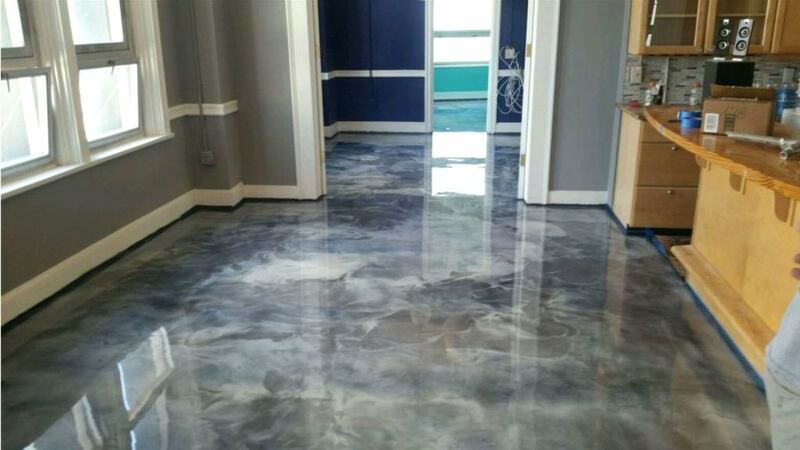 Entrust the installation of your epoxy flooring to Florida Epoxy Pros and be sure to achieve your desired results. Choosing the right team of professional, experienced and reliable epoxy flooring installers is one of the most important aspects in epoxy flooring installation. We at Florida Epoxy Pros work to ensure you will have long lasting epoxy flooring and reap all the benefits that come with its installation.